Straight up, I am not taking any credit for this, as it is all played out well enough on stackoverflow. 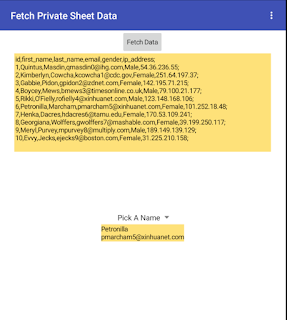 GAS – Create PDF from Google Form Data, Save to Google Drive and Email It! I first tackled this the hard coded long winded way, capturing the names of all sheets and writing an individual function for each, then moved on the a pair forwards / backwards functions, using “getSheets()” to provide the sheet array. This then lead me to going all dynamic! 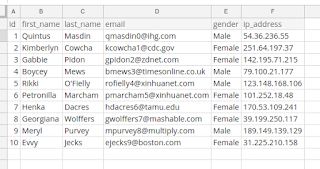 GAS – Google Sheets – Query the whole table ? No you can’t ! You would think that this should be straight-forward, but it is not. Probably not as quick as going Edit > Add Row Above/Below, but provides the starting pointing for extending this little snippet to add content, copy down formulas or “setFormulas” to some of the columns. Useful when working with long lists. This script will add a new row above the existing active cell. I want the value of the variable value01 to become a variable name, result. I want to give result the value green, which is currently in the variable output01. If using a string in output01 you have to have the extra “‘” in the eval(), otherwise a number will not need them. Managing a Google Calendar from a spreadsheet is fairly straight-forward. You do need the calendar ID and all your ducks lined up on the sheet. I use this a lot, but not enough to remember how to do it each time! Nice little equation that I can’t take credit for, can’t remember who provided it in the first place. You want to make life easy for your users, and reduce the opportunity for errors when entering data! This simple example allows a cleaning supervisor to enter their inspection scores (items clean / items dirty) for an area, calculates the percentage score, then moves the information to a second data sheet in a list. There is a drop down validation for the locations, and the date field validation allows a double click to bring up a mini calendar. The script is attached to the Submit drawing. At the end of the script, all the fields are cleared ready for the next entry. scripts, or as checks to make sure they have selected the correct row. Cor blimey, this one was a toughy to get to the bottom of! No amount of googling brought me the solution I needed, however by combining resources from three/four places I finally got there. Now the filter function in Google Sheets is a lovely thing, but it doesn’t play nicely if you want an array formula, that is a formula that automagically fills down as you add more data to a sheet. So you have to convert over to using vlookup (or other method) to get the result you want. Now on the face of it vlookup will only handle one criteria, but it can be forced, with a fair bit of jiggery pokery to handle multiple criteria, and then work as an array formula. This one has been annoying me for a while but I finally arrived at a solution. It is especially usefeul when working inside a G Suite domain, and you wish to share information on a spreadsheet with some selectable cells (e.g. with drop downs) via a classic googlesites page, so for people with the right permissions they can use the functionality of the sheet without causing damage to the underlying data. The default options and gadgets for presenting a spreadsheet offer too much of the sheet for my liking. The way to sort this out is to create a web App that can be displayed on the page. The apps script is created on the website (Manage Site > Apps Script), and once the two parts are created inside a project, the app can be deployed and will then show up when added to you page.